Daisy and Mara are living in the front yard. There are a number of reasons for this; primarily, it’s been the safest option for Daisy and the easiest option for me. Poor yard! The yard itself got the short end of the stick, but it was already well on its way to being trashed after being Sid’s playpen and Sunshine’s hospice area and it will come back to life with a little tlc. When Daisy miscarried, I wanted to keep a very close eye on her to make sure there were no complications. And when Mara arrived, I wanted to keep a very close eye on the two of them to make sure they were bonding properly and that Mara was getting enough milk. And throughout it all, I was milking once or twice a day. And, being that it was the middle of winter, being that February was a frozen hellscape, I didn’t want Daisy traversing the ice if she didn’t have to, and I wanted the shortest commute possible. The barn was occupied – half by Sir Baby and Jupiter (who must stay separated from the cows this time of year) and half with a haystack. Even if we moved the haystack, that part of the barn doesn’t have an adjoining, fenced-in outside area, and being outside in the sun in winter is actually warmer than being inside the barn during the day. The corrals, which also have shelter, were also occupied, and too far from the house for my liking. The yard was the best option under the stressful surprise circumstances of Daisy’s miscarriage, but if Daisy and Mara were going to winter in the yard, they needed some sort of shelter. So, we backed the horse trailer to the north edge of the yard, giving the trailer itself full southern exposure, rearranged some fences, filled the trailer with straw, and viola! A portable barn. A portable barn! I now want to learn to weld and retrofit Mike’s older horse trailer (abandoned and unused for a decade) into a deluxe portable barn with a tiny loft for me. When Daisy miscarried, I immediately began milking her twice a day. In the beginning, it wasn’t even about having her milk to drink. I was dumping it, as she’d been given a few shots by the vet and her milk wasn’t fit for man or beast while the medication was in her system. I milked her to keep her body producing milk so that, at some point, she could adopt a calf. 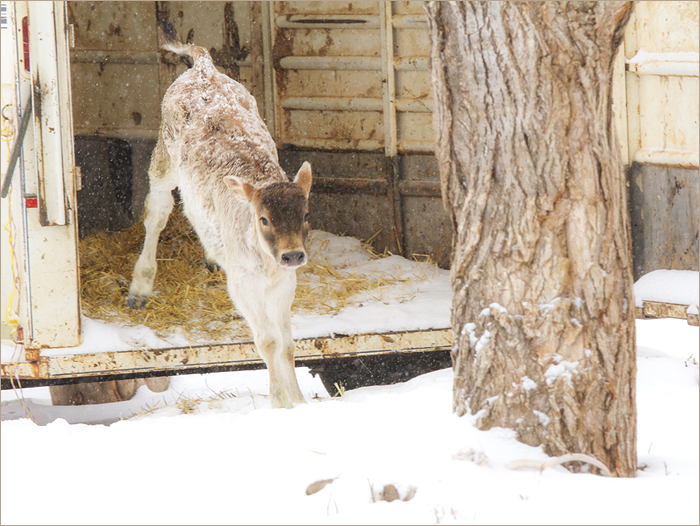 Calving season doesn’t start around here until February, and we don’t begin calving until March. I did not want to wait that long to find a baby, both for Daisy’s benefit and mine – the difference between milking once a day (when there’s a calf to help me out) and milking twice a day (when I’m on my own) is enormous. And I believed the sooner Daisy got a calf to call her own, the easier it would be on her. So I called a guy. When I’m not milking Daisy, I buy two gallons of fresh, raw milk each week from a man who has a couple dozen dairy cows (who he milks by hand!! a god among men). 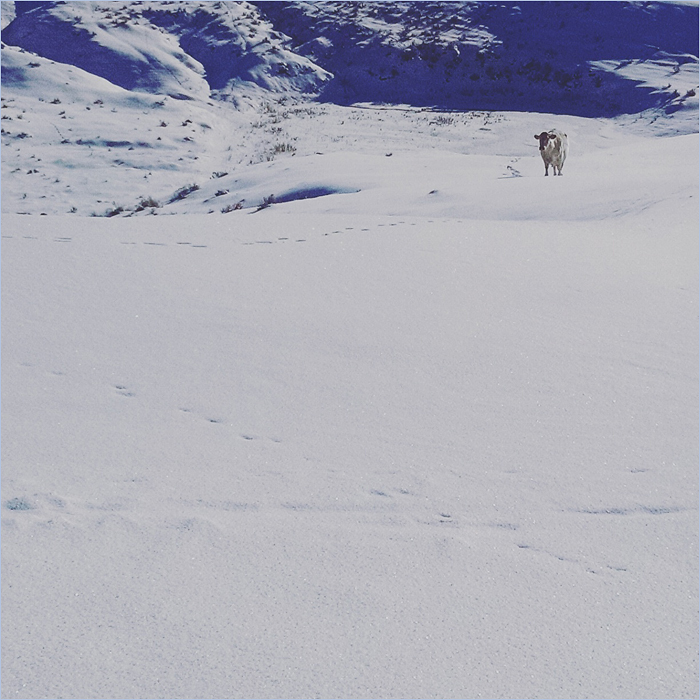 He lives two hours north of here and delivers his milk to various towns in the area – selling raw milk is now legal in Wyoming, as it should be everywhere. 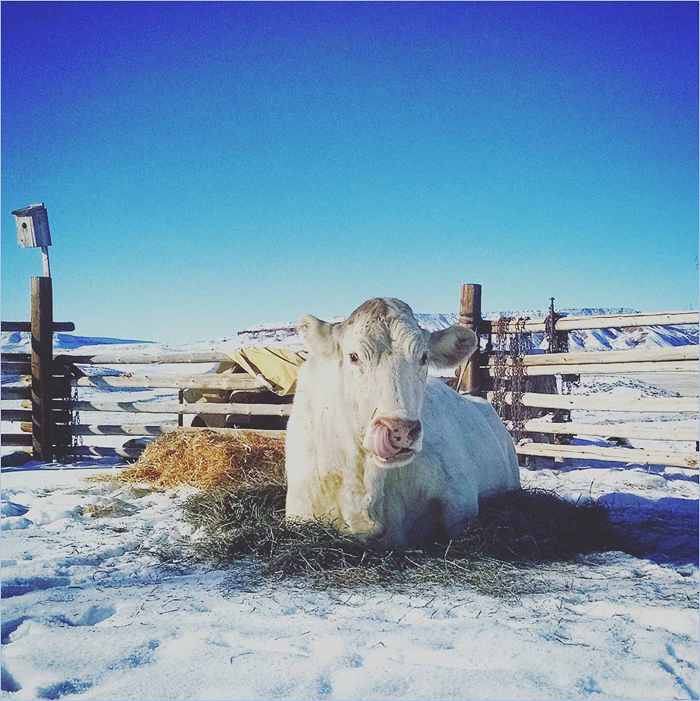 While beef ranchers aim to have all their cows calve (have babies) once a year at the same time, dairy farmers tend to stagger this and have their cows calve at different times throughout the year, so that they have a constant, consistent supply of milk to sell. So, I called my milkman on the epically remote chance that he might have a young, female calf that I could buy. He said he did have a heifer calf! Who was ten days old! But he didn’t want to sell her as he was planning to keep her for his herd. He offered to milk Daisy for me if I wanted to bring her up to his place, and I thanked him, but told him I wouldn’t be able to stand being that far away from Daisy and that I’d keep looking. He called back an hour later to tell me that he’d be willing to sell me his calf, after all! I think he realized she’d be going to a good home. About a week after Daisy miscarried, after I was sure the medicine had run through her system, the milkman and I met halfway and transferred the calf from his truck to mine. 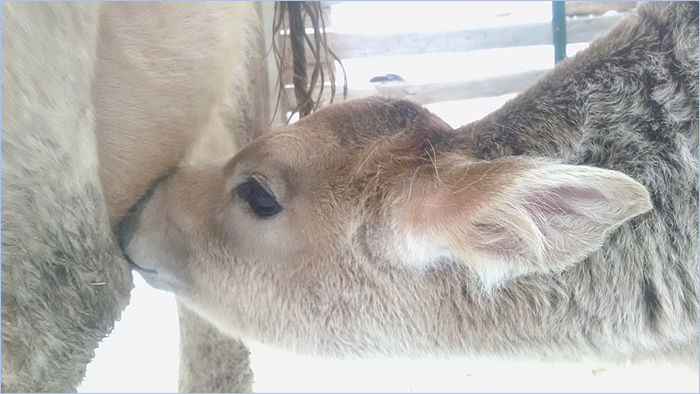 She’s a Brown Swiss – a dairy breed (Daisy is 3/4 Brown Swiss, 1/4 Jersey) – so she will grow up to be a dairy cow, too! She was so calm and comfortable during the ride home, mellow and incredibly sweet. I wasn’t sure how Daisy would react to her. Daisy always accepts orphans eventually, but sometimes it can take a week or two for her to really adopt them. In the past, there have been occasional bouts of dancing and kicking, when a calf loves Daisy but Daisy doesn’t yet love it back. When we put this sweet calf in the yard with Daisy, I was prepared for her to try to nurse and for Daisy to walk away. Instead, it was a beautiful union. Daisy saw the calf and dashed over to her with a mama moo that said, “THERE YOU ARE!!!!! I’ve been wondering where you were!!!!!!! !” And Daisy started licking the calf and the calf started nursing and they have been a total love match ever since. I named the calf Mara, short for Marasmius oreades, the latin name for the Fairy Ring Mushroom. 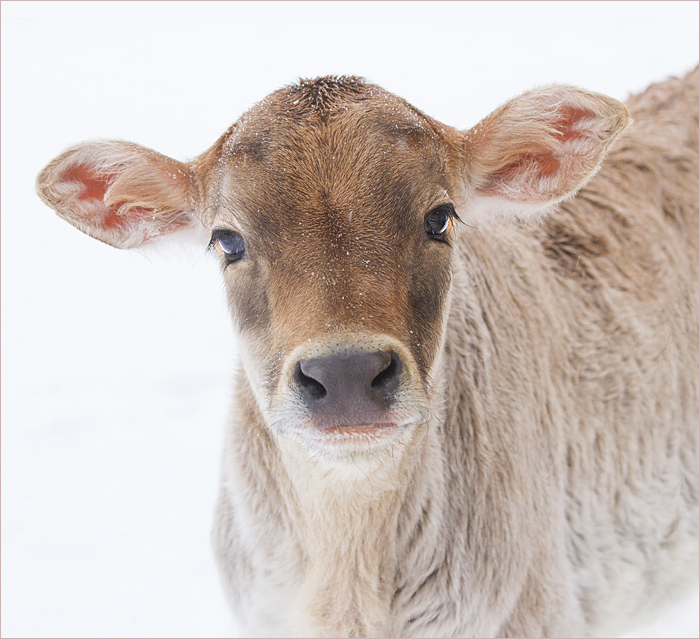 Brown Swiss cows have mushroom-colored coats (Daisy is an anomaly and though Mara has a light body now, her adult coat will likely match her face). And she is so fairy like! She is gentle and perky and sweet and sprightly (though her bones and joints are huge; I bet she’s going to get bigger than Daisy) and the way she came into our lives is truly due to magic. The following is a compilation of my recent posts to Instagram & Twitter, in case you missed it…. Here’s Daisy following me to the house so I could put her in the front yard. Sir Baby broke out of his quarters on March 31 and bred Daisy when he WAS NOT SUPPOSED TO. Nine months from March 31 = now!!! Daisy’s in labor and I made a nest for her in the yard so I can keep a close eye on her. I’ve tried to keep Daisy and Sir Baby apart the last few years because she’s had a lot of trouble with his calves. Nervous and hopeful. Emergency number of my vet on speed dial. Thankful for the mega moonlight but ughhh about the negative temps. Currently 12° and the sun just went down. Thinking of live tweeting since I’ll be up all night…. Hauling drinking water for Daisy. Yard water is shut off during winter so I tote gallon after gallon from kitchen sink to a tub in the yard for her. Currently 5°. Maybe it won’t get below zero tonight! Daisy is still standing up with her tail out. Early stages. Feeling sleepy so I went outside. Brisk! Nothing new to report. Zero degrees, cold enough that it hurts to yawn outside. Daisy just wants to be brushed! “Brush my moonbody in the moonlight,” she says. Charlie’s dancing for us. He doesn’t sleep if there’s activity outside. And he has SO much fur, the cold doesn’t faze him. So Mike has this trick where he feeds his cows in the evening and then they don’t calve at night. It works surprisingly well. I gave Daisy a lot of hay this evening…Would not be mad if she waited until the sun came up, it would be so much easier on the calf. Still watching tho! All the other cows are coming up to say hi to Daisy in the yard. They’re having a proper gossip sesh over the fence. Daisy is still in a (somewhat frustrating) holding pattern btw but feeling quite good about herself and sunbathing. Daisy Update: She was in labor, but never to the point where I saw hooves, and then the next day acted like she wasn’t in labor at all. But she didn’t show any desire to be with the other cows, wasn’t mooing to them, was happy to be by herself. 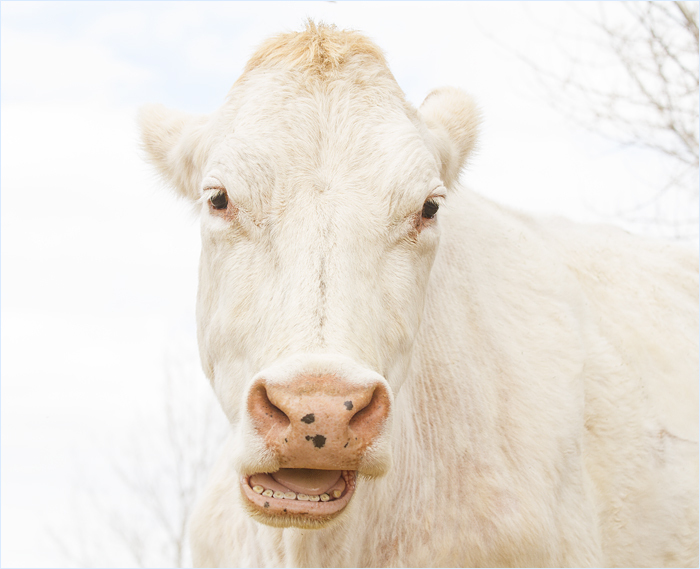 Which is a labor sign – they like to go off alone to calve. But she was no longer showing the physical signs of labor. None this is how it’s supposed to go if it’s going right. So yesterday I took her in to have an ultrasound. I’m very sad to report that her baby was dead inside her. She was fully dilated so the vet was able to deliver the calf. 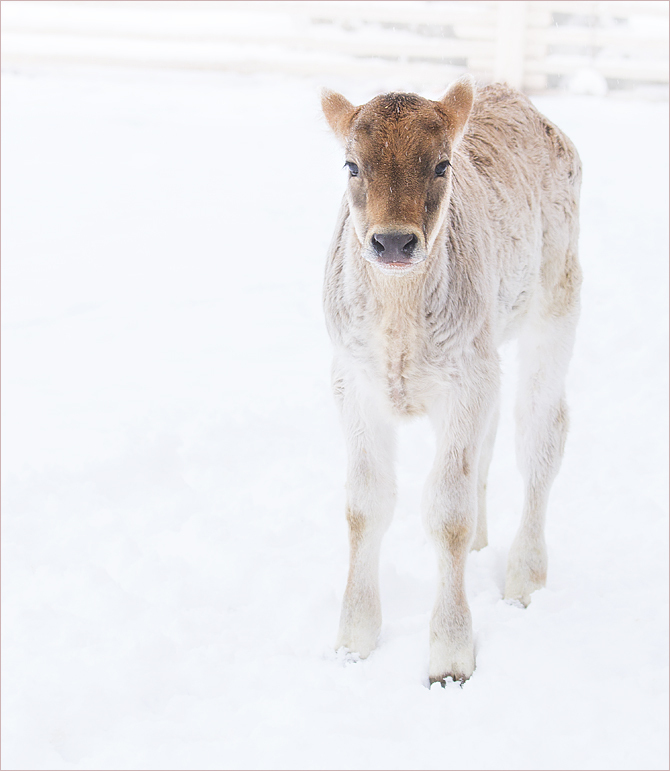 The calf wasn’t properly formed and its death triggered Daisy’s labor (versus labor issues causing its death). Daisy has a low fever (her body’s response to the dead calf inside her) but she is OK and will be OK. This makes me OK. The saddest part is that Daisy loves being a mother…. she made the “Mommy moo” when she birthed the placenta and it totally broke my heart. But I’m milking her twice a day to keep her body producing milk and perhaps she will adopt an orphan calf when calving season begins. 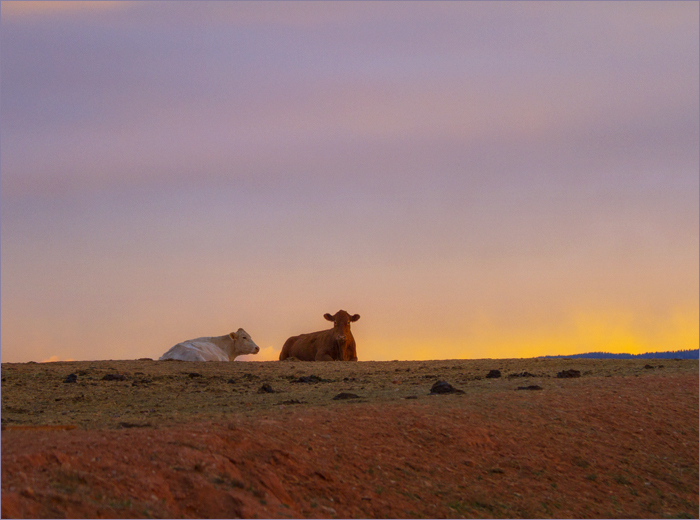 They say rural life, farming life, ranching life is the simple life. It’s not simple at all. I have a story for you!! Just as soon as my hands uncramp from milking four gallons twice a day….